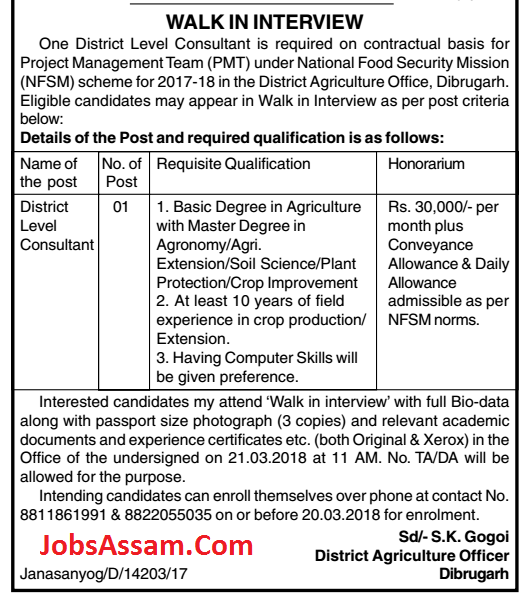 Organisation Name: O/o District Agriculture Officer, Dibrugarh. 2. At least 10 years of field experience in crop production/ Extension. 3. Having Computer Skills will be given preference. Pay: Rs. 30,000/- per month plus Conveyance Allowance & Daily Allowance admissible as per NFSM norms. How to Apply: Interested candidates my attend ‘Walk in interview’ with full Bio-data along with passport size photograph (3 copies) and relevant academic documents and experience certificates etc. (both Original & Xerox) in the Office of the undersigned on 21.03.2018 at 11 AM. No. TA/DA will be allowed for the purpose. Intending candidates can enroll themselves over phone at contact No. 8811861991 & 8822055035 on or before 20.03.2018 for enrollment.